This lecture delivers extensive information about the topic Osteonecrosis. Section one deals with Ankylosing Spondylitis. In the beginning of this lecture, the general aspects of this condition are covered. After that, the epidemiology and genetics of spondyloarthropathies are discussed in detail. Its pathology, pathogenesis as well as triggering factors are also explained. The educator then demonstrates the disease with the help of an X ray pelvis in normal and affected joint. Synovitis and inflammation in this condition are then elucidated. This section also includes the various stages of the disease. In the end, the condition is appreciated in pelvis and lumbosacral spine. Section two is dedicated to the discussion of Axial Spondyloarthropathies. In the start of this section, the symptoms on presentation are discussed. Moving forward, the educator also talks about the signs and examination. Typical posture (Ankylosis Spondylitis Posture) is also an apparent sign, which is explained in this section. The changes in peripheral joints are also introduced in this section. The changes are then appreciated through radiology, imaging and X- ray examination. This section is concluded after mentioning the differential diagnosis of this section. 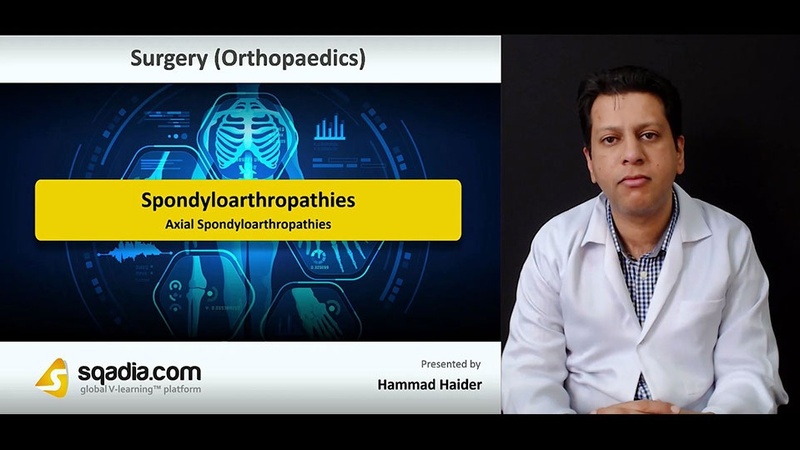 Section three is about the Treatment of Axial Spondyloarthropathies. Firstly, the history and examination of the disease is covered. This is followed by treatment and general measures regarding this condition. The use of NSAIDs and TNF inhibitors is also discussed in this section. The educator also suggests certain operations and discusses its complications in the end of this section. Section four deals with the Reiters Syndrome and Reactive Arthritis. Initially, some general aspects are covered. Moving on, the educator explains the Reiters syndrome trio, its cause and pathogenesis. The syndrome is then elucidated through its acute and chronic phase. Lastly, its investigations, differential diagnosis and treatment are pursued. Section five imparts detailed information about Juvenile Idiopathic Arthritis. Some general aspects are initially discussed, followed by its cause and pathogenesis. 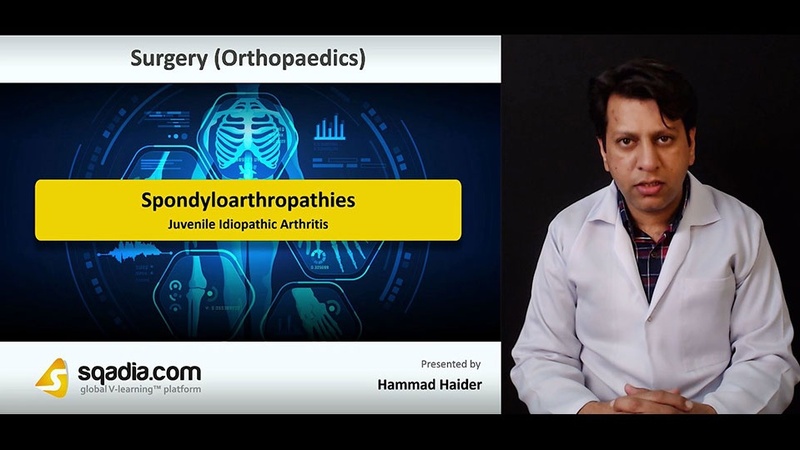 The educator then focuses on systemic, oligoarticular and polyarticular juvenile idiopathic arthritis. The radiology and lab workup of this condition are then brought under discussion. This lecture is concluded by explaining a general treatment for this disease.